AmazonSmile will donate 0.5% of the price of your eligible purchases to the Somerset Cottage Poodle Rescue. It's easy; just click on the AmazonSmile link on the left and login if you are already an Amazon shopper, or create an account if you are new to Amazon. It will remember the selection, and then every eligible purchase you make will result in a donation to the Somerset Cottage Poodle Rescue. Thank you for thinking of us when you shop Amazon. ​Visit the AmazonSmile website. Max and Neo donate one for one to dog rescues and shelters for every product sold! They send us donations every few months! Nice People, Nice Stuff! 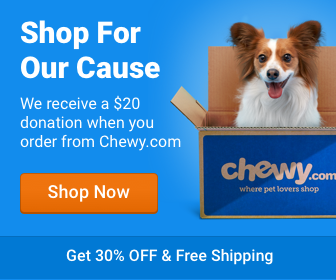 Order your Pet Food at Chewy.com and Somerset Cottage Poodle Rescue will get a $20 donation! For first time customers only.